ST PETERSBURG, February 11. /TASS/. 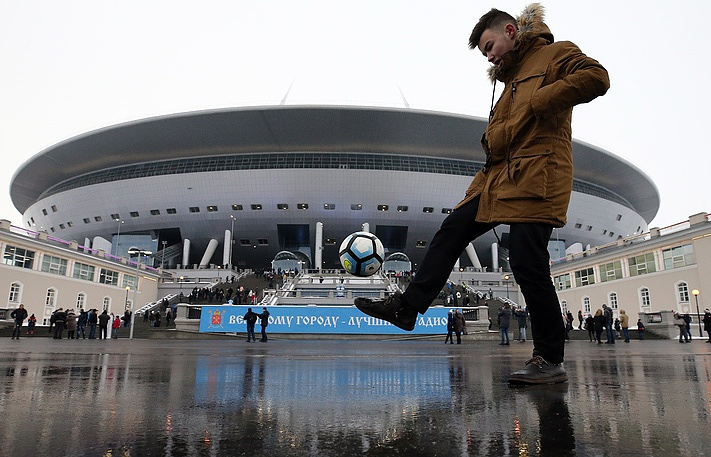 Zenit Arena, St. Petersburg’s long-awaited stadium in Krestovsky Island, hosted 10,000 spectators for its first ever sports show on Saturday. Security checkpoints at the stadium gates were put to a test when nearly 10,000 spectators, journalists and city officials were lining up to enter. The people were shifting from foot to foot as it was either raining or snowing. However, nobody seemed to notice as was eager to get into the ‘spaceship,’ as the stadium was nicknamed for its shape resembling a flying saucer. Police, emergency and security officers alongside ambulance crews were in charge of security at the arena. Catering zones were popular with the arriving spectators. Volunteers in yellow vests helped people to occupy empty seats. "I am thrilled to be here today. The stadium is impressive and actually, it is not surprising, as it has been heavily invested. It is great I will be able to say in the distant future that I was a volunteer at this event," said Yaroslav, a student of St. Petersburg State University. Wheelchair spectators found themselves comfortable enough in the places specially designed around the arena for disabled spectators. Among the spectators are FC Zenit’s fans in blue-white scarves (the club’s colors). The show began at twilight with dozens of dancers simulating a football match. "My dream has come true. I have been waiting for this moment. The stadium is quite exclusive and I hope it will bring good luck to St. Petersburg," Vyacheslav Malafeev, a retired footballer who played as a goalkeeper for FC Zenit, said on stage. Vice Governor Igor Albin told reporters that the builders got accustomed to the Zenit Arena name. "FIFA names stadiums for the 2017 FIFA Confederations Cup and the 2018 FIFA World Cup. This one is called St. Petersburg Arena but in the future St. Petersburg residents will vote for its name," Albin said. "The governor has suggested that a contest be organized for naming this facility. 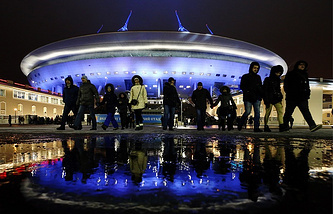 We, the builders, define it as Football Stadium Zenit Arena as we got used to this name." Temporary infrastructure is expected to be finished by April 1 along with the arena’s adaptation to FIFA requirements, he said. On February 22, the arena will become a venue for a concert staged for 35,000 spectators. The over 68,000-seat capacity stadium designed to host the 2017 FIFA Confederations Cup and the 2018 FIFA World Cup matches was laid down in the western portion of Krestovsky Island in St. Petersburg in 2007. The construction project was amended three times: in 2008, 2010 and 2013. The main construction phase finished on 29 December 2016. Eight nations have qualified for the 2017 Confederations Cup and they are the competition’s host, Russia, 2014 FIFA World Cup Champion Germany, 2015 Copa America Champion Chile, 2015 AFC Asian Cup Champion Australia, 2015 CONCACAF Gold Cup winner Mexico, 2016 UEFA Euro Cup winner Portugal, OFC (Oceania Football Confederation) Nations Cup winner New Zealand and the 2017 Africa Cup of Nations winner Cameroon. The draw for the 2017 FIFA Confederations Cup was held on November 26, 2016 in the Russian city of Kazan. Following the draw, host Russia was placed in Group A alongside Portugal, Mexico and New Zealand. Group B brought together Germany, Chile, Australia and Cameroon. The opening game of the 2017 FIFA Confederations Cup will be held at the newly-built 68,000-seat capacity football arena in St. Petersburg on June 17 between Russia and New Zealand. Russia will face Portugal in Moscow on June 21, and on June 24 it will play Mexico in Kazan, the capital of the Russian republic of Tatarstan.